When you first visit Italy, it's hard to imagine just how good the Italian food is going to be. No matter what part of the country you visit, even the worst food is generally really good. And if you want to find some of the best Italian food in Italy, head to Bologna, considered to be the gastronomic capital of Italy. The food scene in Bologna is fun, a fact not lost on the Bolognese. They make food approachable, and seem to be enjoying it as much as the rest of us. If you love all things Italian food and wine and are thinking of building an entire vacation around Italian food, stop thinking and do it! There are enough great restaurants, food events and attractions, culinary activities, food tastings, and food tours in Bologna and Emilia Romagna to ensure Bologna more than lives up to its nickname of La Grassa, La Rossa, e La Dotta (the Fat, the Red, and the Learned), and now is the perfect time to go. Here are just 12 gastro-inspired things to do in Bologna, Italy that every foodie will love - but we know you'll find more! The trouble with eating Italian food is that five or six days later you’re hungry again. If you love wine - or even if you don't - you should try the unique wines of Emilia Romagna, and become a new fan. Visiting the region's many wineries is a great way to see and sip your way through Emilia Romagna. What I love most about the wines of Emilia Romagna is that they're as unpretentious as the people who produce and enjoy them. Winemakers here are open to innovation and willing to experiment...it all comes down to making and drinking good wine, and it they just happen to be some of the best Italian wines we’ve ever tasted. Try a small group Bologna wine tour like the half day Bologna Wine Tour we took to three well-known and unique wineries. You'll taste Lambrusco, the wine Bologna is known for, but also innovative twists on classic wines like sparkling Barbera. A big star among Bologna wines is Pignoletto, made from the pignoletto grape, a crisp, medium bodied Italian white wine with a slight fizz and a beautiful straw color. It's so drinkable, which is very good....and very bad! No one does Happy Hour like Italians, unless you're on a cruise somewhere and don't care about starting your happiness before it's 5 o'clock somewhere. Otherwise, you're good to go in Italy every day around 6:00pm, so get in the spirit. The work day in Bologna begins winding down in late-afternoon, when the chairs and tables come out and friends start to gather for Aperitivo. Local restaurants have Aperitivo specials for a nominal fee, which usually includes a small plate of snacks and a cocktail or two, and can often make a filling and satisfying dinner for the evening. If you're feeling fancy, opt for an Aperol Spritz - arguably the cocktail to drink when you're in Italy. But if the bright orange Aperol liquor is too bitter for you, try an Hugo Spritz (pronounced OO-go) made with elderberry liquor instead of Aperol. It's my new favorite Italian cocktail! The Bologna food market Mercato delle Erbe is a slice of Bologna life and a great place to visit if you want to feel local. You'll find plenty of fresh fruits, veggies, nuts, spices, pastas, olive oil, and balsamic for a perfect meal. You'll also see a lonely equine vendor - off by himself in the corner away from other vendors as mandated by law. Many Italians still enjoy lean and iron-rich horse meat in their diet and we eventually tried it as air-dried carpaccio over fresh arugala. It didn't have a lot of taste and I admit it was hard for me to get the mental picture out of my head. But we eat what the locals eat, even if it's not always our thing. Bologna is also home to some of the oldest food markets in the world still in operation, and a stroll through them is the most delectable history lesson ever. The Quadrilatero, the oldest market in Bologna, was formed during the Middle Ages and housed the main craft guilds of the city within its confines. The goldsmiths, butchers, fishermen, “Salaroli” (workers who salted meat to cure it), barbers and the Society of Painters were all based in this area. Most of the guilds were located along the street once called Mercato di Mezzo, known today as via Rizzoli. But today, this Bologna food market lies in the heart of the Quadrilatero, renovated in 2014 and reopened as the first indoor market of the city. The three story Mercato di Mezzo is open seven days a week, from 8:30 a.m. until midnight, with a traditional pizzeria, Baladin Bologna artisanal beer pub, and tasting events. 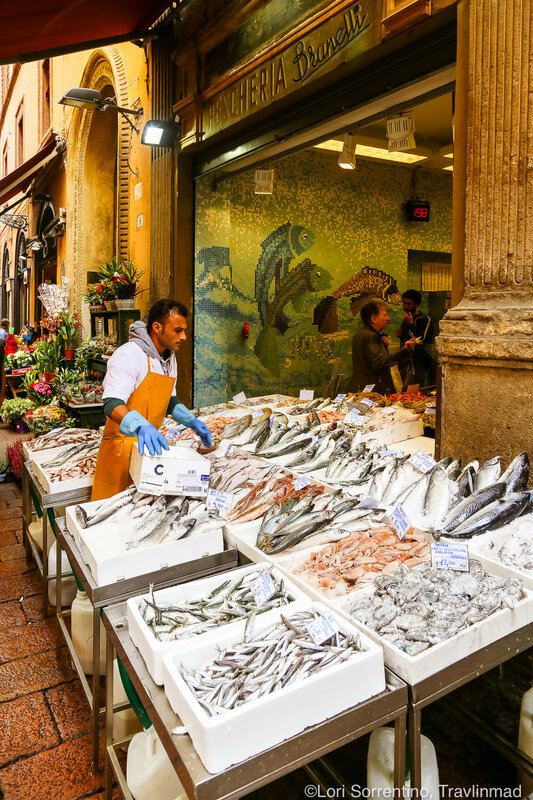 Throughout the Mercato di Mezzo and the streets within the Quadrilatero you'll find wine bars, restaurants, and food vendors selling everything from fresh baked breads, cold meats and cheeses, and hand made tortellini, to the freshest seafood catch of the day. The area has also preserved the historic architecture, making it a genuine artistic treasure as well. Shopping for lunch is a great way to spend the afternoon here. Grab some cold cuts, cheese, bread, and wine, and head for the nearest piazza or better yet, L'Osteria del Sole. If you not only love food but history and culture as well, the Oldest Tavern in the World will strike a chord, and you'll want to bring the bundle of food you bought in the Quadrilatero to eat here. This place dates to 1465 - 1465! L'Osteria del Sole oozes so much history, that if these walls could talk you'd surely hear Galileo and Da Vinci in tantalizing conversation over beers! Order a beer or wine at the bar, then settle down at one of the large community tables and enjoy your lunch. They don't serve food (you have to bring your own), but the birra and vino are plentiful, and its all about the company you keep. A dedicated Bologna food tour is a great way to get to the heart of this foodie city, and we've taken several good ones since our first trip to Bologna. One very good Bologna food walking tour winds you through the historic city noshing on some of Bologna's most iconic foods. Several local tour companies take you on day trips from Bologna to food factory tours in Parma, Modena, and Brisighella in Emilia Romagna, while others take you on tasting tours to some of the best restaurants in Bologna. No matter which one you choose, there's no better introduction to the amazing cuisine of Emilia Romagna. Three of the most notable Italian foods come from Emilia Romagna: Parmigiano Reggiano, Balsamic di Modena, and Prosciutto, and they're all produced to exacting standards - government-imposed regulations that ensure such a high quality (#DOP or protected designation of origin) that no imposters stand a chance against them. Trust me (and forgive me) when I say you'll be ruined forever when you try them here! You can read all about how they produce parmigiano reggiano (the King of Cheeses), authentic Balsamic di Modena (please don't call it vinegar), and prosciutto and think that you can buy all three at your corner grocery store. But then you'd miss out on some of the most food fun you can have in Bologna. We recommend you experience the making of all three with Italian Days for the full educational and tasting experience - and guarantee you'll be a #DOP disciple for life. Your whole Italian food repertoire is going to change once you try the food in Bologna. Taking a cooking class in Bologna is the perfect experience for anyone who loves Italian food. You'll learn to finger-twist your own tortellini, roll out a mean tagliatelle, and create one of the most famous Italian dishes - a classic Ragù Bolognese, so you can recreate these dishes when you get home. There are several to choose from: the Culinary Institute of Bologna gets high marks (although it's pricey), and the Bologna Cooking School with Big Carlo is also favorite. But we love the concept behind Le Cesarine - a network of carefully selected home cooks throughout Italy with the aim of safeguarding and sharing their knowledge of authentic regional food traditions, recipes, and hospitality by opening up their homes so you can connect with local Cesarinas and their families through food. Food is AMORE! Throughout Italy and other parts of Europe, black and white truffles, those exquisite lumps of earthy goodness, grow wild. In the Emilia Romagna region, it's possible to accompany a local truffle hunter and his specially trained truffle dog (nope, by law, pigs are no longer used in Italy) on an afternoon truffle hunting tour in the woods to search for these culinary delights. Even better is that most tours include a truffle dinner featuring your day's find prepared for you by a local Chef. Can you think of a more perfect farm-to-table foodie experience in the culinary capital of Italy? Since 2013, the October Tortellino Festival is a popular one evening foodie event by local organization tOur-tlen celebrates the tortellino, Bologna's most signature of all foods - a perfect reason to craft your Bologna vacation in early October. Talented local chefs and restaurateurs come together for an evening of fun and friendly competition to create the tortellino of their (and our) dreams characteristic of their city. There's just two rules: the dough must be traditionally rolled using a wooden rolling pin and must be shaped to the classic small tortellino. It's one of the city's unique culinary events that honors the cultural heritage of Bologna. For visitors, it's a delicious way to see the local food scene in action! On the first three weekends of November, the hot food ticket in food festivals is the Savigno Fall White Truffle Festival, celebrating one of the world's most exquisite foods. Nearly 50,000 truffle lovers attended in 2017 and the last three festivals have brought national recognition. Today it ranks among the top truffle events in the country. Not too far from Bologna in Modena is the world-renowned Osteria Francescana, a 3-star Michelin establishment and perhaps the most famous restaurant in Italy. Chef Massimo Bottura skillfully reinvents the cuisine of Emilia Romagna and the experience is one you'll never forget. But that experience comes at a price so if you don't mind splurging, reserve your table - at least three months in advance. There are several other excellent Michelin restaurants not far from Bologna worth traveling to. Trattoria da Amerigo in Savigno - home of the annual Savigno Truffle Festival in November - is a cozy, unpretentious place with hearty portions. Try the reasonably priced tasting menu. Just south of the city is Ristorante Marconi in Sasso Marconi, a Michelin honored restaurant since 2008. Ristorante I Portici, in the heart of Bologna on Via dell'Indipendenza with food as elegant as the historic 18th century theater it resides in. Just a few blocks from Bologna's city centre is the Margarita Gardens, or Parco Giardini Margherita, a lush urban oasis, and the largest and most popular park in the city. Walk south on any through-street from the historic centre, cross the street and enter the gorgeous wrought iron gates to the Park. Late afternoon when the sun is setting is a great time to come. There are a few concession stands and often good food trucks near the entrance. During the warmer months we recommend grabbing a table at the Greenhouse, bringing a bottle wine or buying one there, and ordering some food to go with it. On most nights you can enjoy live music, poetry readings, or lectures, and the charming market lights create such a cozy setting that you may never want to leave. Like many cities in Italy, the Bolognese end their day with a cup of their favorite gelato (though many eat several small cups throughout the day). So, as the saying goes....when in Bologna. Check out some of our favorite gelaterias to get you started - but since there's a gelato shop on every block, you'll soon find your own personal favorite. Before you know it you'll have created your own Gelato Tour that you can add to through the years... because you will, of course, always return to Bologna! You may or may not be wondering about the omission of the newly opened FICO Eataly World to this list of Gastronomic Must-Dos in Bologna. The commercial 25-acre ginormous agri-food park that promises visitors “a discovery of all the wonders of Italian biodiversity" under one roof isn't exactly the kind of authentic travel that we love. While we realize some visitors may have limited time during their stay, we always advocate traveling locally and experiencing the heart and soul of Bologna through a local tour. The City of Food is safe and easy to navigate on your own, and there are plenty of local tour operators, restaurants, and event organizers to help you explore the local culture and food of Bologna - even with limited time. We hope we've provided enough links and resources to get you started, and encourage you to explore Bologna in a slow and local way! Centrally located in the historic centre down a quiet street is the Hotel Touring, a family-owned and operated hotel with a homey feel, but one of its best features is a panoramic rooftop terrace. Simple, ultra comfortable, and just a few minutes’ walk from Piazza Maggiore. Check prices and details. If you're looking for modern elegance, Portici Hotel is a good choice. Located within walking distance to the city center near the University, one of the best parts about staying here are the cooking classes through Bottega Portici! Check out the latest rates and more details. The city's only 4-star luxury is at the Hotel Corona d'Oro, super close to the Piazza Maggiore. Get the latest prices and details. The Viennese-style Hotel Novecento on Piazza Galileo has gorgeous contemporary rooms & suites with marble bathrooms. Some rooms also have outdoor terraces with great views! Check out the latest prices and details. Simple, elegant, and generally under $100 USD/night, the Art Hotel Orologio is a great value in the heart of the city centre. Check out the best rates and more details.